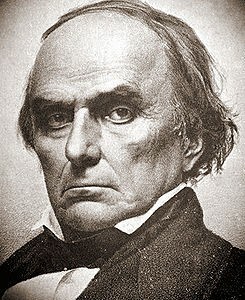 Daniel Webster (January 18, 1782 – October 24, 1852) was a leading American senator from Massachusetts during the period leading up to the Civil War. He first rose to regional prominence through his defense of New England shipping interests. Webster’s increasingly nationalistic views, and his effectiveness as a speaker, made him one of the most famous orators and influential Whig leaders of the Second Party System. He was one of the nation’s most prominent conservatives, leading opposition to Democrat Andrew Jackson and the Democratic Party. He was a spokesman for modernization, banking and industry, but not for the common people who composed the base of his enemies in Jacksonian Democracy. 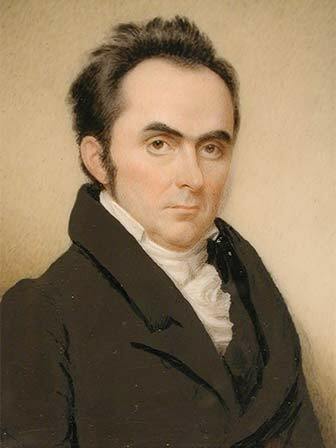 During his 40 years in national politics, Webster served in the House of Representatives for 10 years (representing New Hampshire), in the Senate for 19 years (representing Massachusetts), and was appointed the United States Secretary of State under three presidents.